Moxy Solutions’ call center system leads the field in technology and features and is rapidly growing to become the industry leader. Moxy’s software is finely-tuned to streamline the deal closing process and unleash the complete potential of an inside sales team. With the industry’s most forward-thinking interface for presenting a dynamic quoting matrix on-the-fly based on customer needs and survey responses, and automated sales follow-up triggers, Moxy helps you sell more product with less effort thru its precision accuracy. From marketing automation to product fulfillment, AdSoft Direct’s partnership with Moxy Solutions processes over 10,000 jobs per month on a nightly basis featuring automated data transmission, product customization and PDF generation, data cleansing, and transmission to our network of local vendors with production teams that have been painstakingly trained to get orders out the door the same day as they are received. 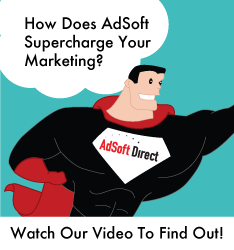 If your next print marketing or fulfillment project depends on high levels of customization and precise execution with the possible need for custom software development and a world-class customer service team, then AdSoft Direct may be partner you can’t live without.